Young Israelis are voting conservative at levels significantly greater than their parents. Many pundits are convinced Israeli Prime Minister Benjamin Netanyahu has the Jewish state’s youngest voters to thank for winning his squeaker of an election victory on April 9. “The kids are all right-wing,” pronounced journalists Laura Adkins and Ben Sales in an article published by the Jewish Telegraphic Agency. Adkins and Sales recognized that while American millennials seem to be mostly liberal or even left-wing, young Israelis are voting conservative at levels significantly greater than their parents. According to the 2018 nonpartisan Israeli Democracy Index, about 64 percent of Israeli Jews between the ages of 18 and 34 classify themselves as right-wing, compared to only 47 percent of those who are 35 and older. In a survey conducted a week before the election, the Israeli Democracy Institute found “a direct correlation” between the age of the voter and the support for Mr. Netanyahu. A full 65 percent of Israeli Jews ages 18-24 and 53 percent of those 25-34 favored Mr. Netanyahu, while only 17 percent and 33 percent, respectively, preferred his more centrist rival, Benny Gantz. Adkins and Sales attribute this trend to the fact that many young Israeli voters are not old enough to remember the 1990s and especially the 1999 election when the Israeli left prevailed. While they did not experience the signing of Oslo Accords in 1993 and 1995, Israeli millennials, many of them religiously observant to various degrees, grew up with the consequences, especially the so-called Second Intifada, which began in September 2000 when Ariel Sharon, then the leader of the Likud party, dared to visit the Temple Mount. Some historians say the Second Intifada lasted through the 2005 expulsion of Jews from Gaza, and Israel’s millennials remember the aftermath of that crisis, when some 8,000 Jewish men, women, and children were brutally torn from their homes, businesses, and places of worship. Other historians place the end of the Second Intifada in 2008. It is not surprising that these experiences prompted Israeli millennials to reject any political leaders who seem prepared to relinquish additional land seen by right-wing Jews as belonging to the Jewish state. Many millennials served in the IDF during the series of recent armed conflicts undertaken by Israel in response to Hamas’s aggression against Jewish civilians living in communities that border Gaza. These mini-wars have served to reinforce young Jews’ determination not to cede any additional land. A review of the Second Intifada may be helpful to an effort to understand how this Palestinian-Arab armed rebellion helped shape the positions of many young Israelis, especially regarding their appreciation of the unrelenting efforts of the enemy they face to destroy the Jewish state. Many analysts maintain that, of the eight conflicts between Israel and the Palestinian-Arabs, the seventh, the so-called Second Intifada, was the third-bloodiest. It also seemed to be the most senseless. Most wars are waged in order to attain political or territorial goals. However, the Second Intifada’s leaders, PA president Yasir Arafat and the terrorist organization Hamas, had no plans to force political concessions from Israel or to establish new territorial realities. They never even offered any pragmatic solution to end the carnage that was never recognized by anyone as a true war. As Middle East security and international terrorism expert Samuel M. Katz put it, the only real objective of the Second Intifada seemed to be to inflict as much pain and suffering on Israel as possible. To that end, the Palestinian Arabs deliberately planned terror attacks that would produce the highest number of catastrophic deaths, usually of Israeli civilians. Mr. Katz notes that they carried out these attacks seemingly without the slightest fear of international censure or retribution. The terrorists never wore uniforms and did not conduct their activities in the open. Often, they hid among the local Arab population, using Arab civilians as human shields. Arafat, who possessed limited international credibility, never persuaded Israelis that the terrorism of the Second Intifada was a spontaneous national eruption over which he had no control. Rather, Israelis viewed the violent outbreak as proof that all the Palestinian Arabs wanted was to impose the Arab maximalist conditions for peace, which amounted to Jerusalem’s relinquishing every inch of land won in the 1967 Six-Day War and allowing all Palestinian Arab refugees—and their descendants—to flood back into Israel proper, thus demographically destroying the Jewish state. Even worse, young Israelis became aware that the Jewish state had unintentionally provided the Palestinian Arabs with the geography as well as some of the weapons used to wage the Second Intifada. After the Oslo Accords were signed, Israel transferred arms to the Palestinian Security Services, which consisted of more than 40,000 regular army, police, military-police, intelligence services, and coast guard units. These weapons were used against Israelis during the Second Intifada. During the first Intifada, which began in 1987 and ended with the signing of the Oslo Accords in 1993, Israel had maintained control over the Egyptian border. This coupled with the Jewish state’s substantial military presence in Gaza severely limited the quantities of ammunition and weapons the Palestinian-Arab terrorist-military organizations could procure. But this did not mean there were no transfers of weaponry, much of it part of the substantial stockpiles of ammunition that had been abandoned in the Sinai Dessert by the Israeli and Egyptian armies after the 1967 Six-Day War. Egyptian traders found the ammunition, which was then sold to Palestinian-Arab organizations. These weapons as well as explosives produced from materials available in Arab markets, were used by Hamas, the PLO, and Islamic Jihad during the last phase of the first intifada, when military attacks became more intensive. After the Oslo Accords were signed, the territorial changes it effected, enabled Hamas to smuggle thousands of arms through the underground tunnel networks they had excavated connecting Gaza with Egypt. When the Second Intifada erupted, some of the weapons were then transferred to Hamas terrorists based in Judea and Samaria. The Dolphinarium discotheque massacre was a Hamas terror attack on 1 June 2001 in which a Hamas-affiliated Islamist terrorist blew himself up outside a nightclub on the beachfront in Tel Aviv, Israel, killing 21 Israelis, 16 of them teenagers. The Passover massacre was a suicide bombing carried out by Hamas at the Park Hotel in Netanya, Israel on 27 March 2002, during a Passover seder. Thirty civilians were killed in the attack and 140 were injured. 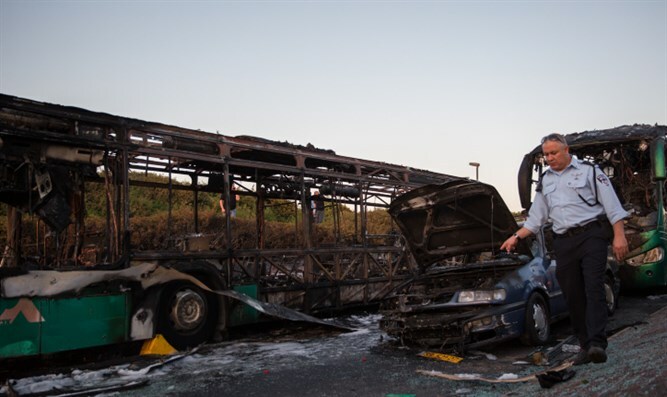 It was the deadliest attack against Israelis during the Second Intifada. On March 29, 2002, the Israelis and Mr. Sharon, who had become Prime Minister, had had enough. They launched Operation Defensive Shield, a military campaign in Judea and Samaria tasked with locating and destroying all banned armaments, seizing bomb-making materials, razing the rocket-manufacturing infrastructure, and eliminating the terrorist commanders and individuals orchestrating the suicide bombings. The Israelis were determined to disrupt the lawless setting in which the terrorists had felt free to formulate, organize, and execute their attacks against Israelis. Operation Defensive Shield was the largest IDF military invasion in Judea and Samaria since the 1967 Six-Day War. Nevertheless, for six months after Operation Defensive Shield was initiated, 14 Palestinian-Arab suicide bombers murdered 81 people and wounded almost 300 more. One of the most horrendous attacks took place at a game room in Rishon L’Tzion, a Tel Aviv suburb, where a Hamas terrorist succeeded in killing 15 civilians and wounding 55. One of the facets of the Second Intifada that has received insufficient attention is the role of Arab women in perpetrating some terrorist attacks. While women were supposedly discouraged from participating in the violence, beyond succoring and shielding “resistance fighters,” as the violence continued, an increasing number of women and children assumed the role of perpetrators. Before the Second Intifada ended, more than 300 women and girls were arrested, leading to the incarceration of 126, including 12 children under the age of 18. While during the first Intifada, only three percent of women engaged in the violence had any political affiliation, by the time women became part of the Second Intifada, 90 percent of those arrested for perpetrating attacks were associated with Palestinian-Arab political parties. About 70 percent of them were affiliated with Islamic terror organizations, including Hamas and Palestine Islamic Jihad. Unprecedently, some of the women were members of their groups’ military wings. When the Second Intifada began, Manal Abu Akhar was a married 25-year-old wife with two small children. Now 44, she recently told Palestinian-Arab journalist Sheren Khalel (“The Second Intifada: The Women’s Movement at a Crossroads”) that it was “hard” to be a woman involved in the uprising. Rather than engage the Israelis openly in the streets, she transformed her small home in the Dheisha refugee camp, just south of Bethlehem, into a shelter for Palestinian-Arab terrorist-fighters. Whenever the Israeli military detained one of these men, she said she used her body to “de-arrest” them. It was a technique she had learned from international activists who came to Judea and Samaria during the Second Intifada not to complain about the terrorism, but to protest against Israeli policies against it. “When [the Israeli army] tried to take someone, we would throw ourselves on the guys and cause chaos so that maybe he could get away,” she told Ms. Khalel. She recalled once climbing into a jeep with the terrorists who had been arrested and then refusing to leave. Because the Israeli soldiers would not drive away as long as she was in the jeep, this gave other fighters time to arrive and help the arrested men escape. During the recent elections, virtually no Israeli-Jewish parties denied the importance of national security. Mr. Netanyahu’s principal opponent was a former army officer and Chief of General Staff of the Israel Defense Forces. His problem was that he was perceived as being more left-wing than Mr. Netanyahu and the fact that he was surrounded and supported by some leftists did not help the situation. In school and through youth groups, Israeli young people spend much more time learning their country’s history than American students do their own. Knowing what they do about the dangers of ceding land to Palestinian groups, Israeli millennials could scarcely be blamed for supporting leaders who at least pay lip service to the need for protecting land. It must be remembered that while Mr. Netanyahu will indeed be the Israel’s Prime Minister for a fifth term, his government coalition, heavily elected by Israel’s millennials, is one of the most right-wing and religious the country has ever seen. Dr. Grobman, a Hebrew University-trained historian, is senior resident scholar at the John C. Danforth Society and a member of the Council of Scholars for Peace in the Middle East.